At our last meeting Frank Ritz brought two bottles embossed with the above title but each was also embossed with different proprietors. 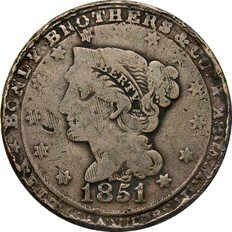 One embossed A.H. POWERS & CO., and the other embossed with SPRUANCE, STANLEY & CO. A simple question was posed as to which bottle is the oldest. They look virtually identical in manufacture, so the challenge was on. 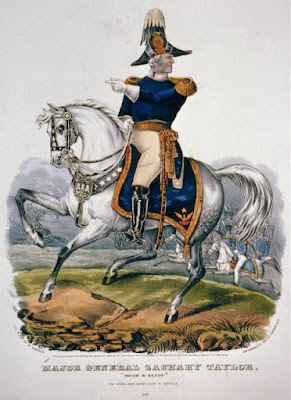 Let me first start with a little background on Aaron Hubbard Powers. He was born March 16, 1829, in New Durham, Strafford Co., New Hampshire. Ten years later he moved with his parents to Boston, MA. Another ten years witnessed young Powers, along with his brother, Lucius, pooling their money along with a company of about 150 other California bound gold seekers, and purchasing the Steamer Edward Everett and stocking it with supplies that could be sold for profit in San Francisco. The company set sail for California January 12, 1849, sailing around South America, and arriving at San Francisco on July 6th. The Powers brothers immediately headed for the mines on the Mokelumne River along with about 100 members of the company. Their overall success was abysmal and the supplies along with the Edwin Everett was sold and divided among the company. Aaron and Lucius Powers remained in the vicinity of Redwood City, San Mateo County, for a few years and had some success in the logging industry. They sold trees for construction of some of the earliest wharves in California and telegraph poles for some of the first telegraph lines. Aaron soon met and married Emma Louisa Sweazey, a native of England and daughter of William J. Sweasey - in 1853. In 1855 the couple moved to Calaveras County, near Campo Seco, where Aaron took up farming and stock raising. Meanwhile his brother, Lucius, gave up farming and opened a storage and commission merchant business in Sacramento for agricultural products. In 1864 Lucius opened a wholesale liquor company - L. Powers & Co. In 1867 Aaron Powers and family moved to Sacramento and joined his brother’s liquor company as a clerk. His brother, Lucius, died in Sacramento on October 1, 1875. Aaron remained in the liquor business until 1887 when he sold out and moved to Fresno County where he had purchased 250 acres of farmland. Aaron and especially his son, Lucius, left an impressive legacy in the field of agriculture in the San Joaquin Valley of California – a crop growing and shipping dynasty that has lasted to this day. Tragically, two years after Aaron and Emma Powers moved to Sacramento, their first born son, Eugene, sought to beat the hot August heat with two friends. They headed for the American River where the other two boys successfully swam to the other side. Young Eugene didn’t know how to swim and thought he could wade across. Alas, he went over his head and slipped into the murky waters, not to be seen alive again. Emma Powers died near Fresno, CA, July 24, 1902, of complications from diabetes. In 1906 Aaron Powers departed from his residence near Sanger, CA, for New England to visit his home state of New Hampshire one last time. From there he decided to continue on for an extended tour of Europe, also with the hope of visiting his son, William, who was studying medicine in Berlin. Aaron died in Vienna, Austria, on April 9, 1907, and his remains were shipped back for interment in the family plot at Sacramento. James M. Henderson, was born in Ohio, in March 1830. His wife, Margaret, was the sister of Aaron H. Power’s wife, Emma Louisa. Henderson. A 49er, Henderson began farming in the vicinity of Galt, CA, at an early day. After a few years he retired from business with Powers and resumed farming, but retained his house in Sacramento, which he built in 1869. His wife was Margaret A., born in England July 1829. She came to the U.S. in 1841 with her father, William Sweasey, and family. They were married in Stockton in 1850, and had five children, three of whom were living in 1900. A copy of the article from the Sacramento Daily Union of January 1, 1880, that describes what was soon to become A.H. Powers & Co. It should also be added that A.H. Powers withdrew from his brothers firm to join in the partnership of Powers & Henderson in 1870. The original front and back labels for DR. MOTT’S WILD CHERRY TONIC as trademarked with the Secretary of State for California on December 3, 1877, by Aaron H. Powers and James M. Henderson. 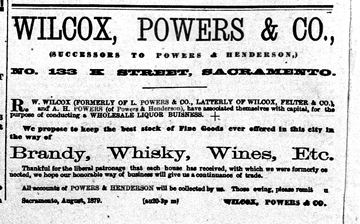 This advertisement from the Sacramento Daily Union on September 20, 1879, documents the formation of Wilcox, Powers & Co. from the previous firm of Powers & Henderson in August 1879. Since A.H. 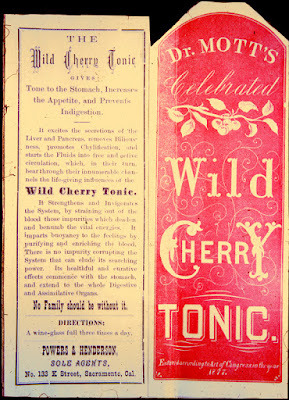 Powers & Co. was not formed until February 1884, the embossed bottles containing DR. MOTT’S WILD CHERRY TONIC, with the name of A.H. POWERS & CO. embossed, could not have been blown before this date. 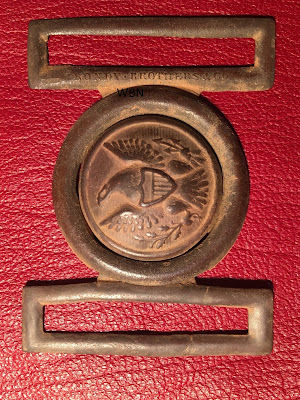 By February 1884 Richard W. Wilcox had left the firm of Wilcox, Powers & Co., and the newly formed company of A.H. Powers & Co. was born. The two bottle variants were unquestionably blown in the same mold. Only the proprietors names were modified from A.H. POWERS & CO. to SPRUANCE, STANLEY & CO. Simple reasoning would determine that the Powers version was made first even though there is no evidence that Spruance, Stanley & Co. either purchased the brand or it was transferred to them. Obviously, since Spruance, Stanley & Co. were partners in the firm of A.H. 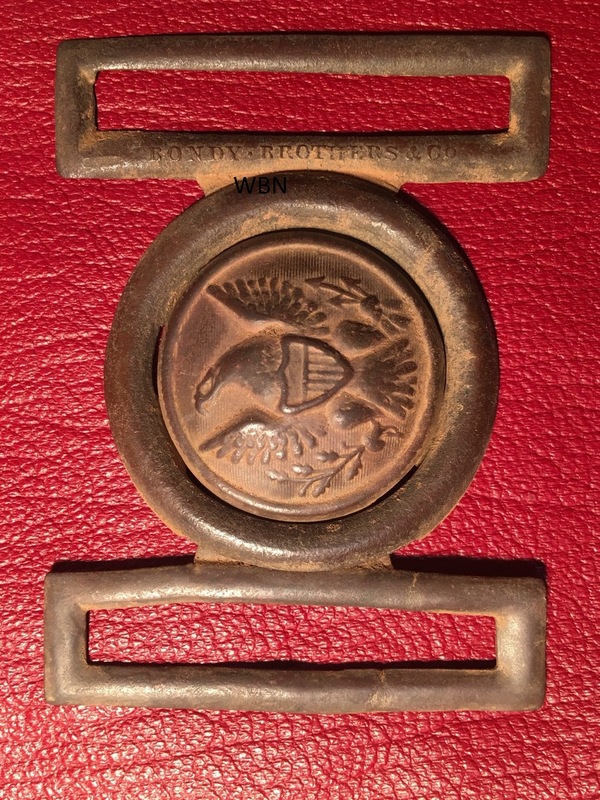 Powers & Co., there may not have been any official statement or transferrence of the brand. It seems most likely that when Aaron Powers retired in 1887 the Dr. Mott’s Wild Cherry Tonic name could have been transferred to Spruance, Stanley & Co., since that company continued on in San Francisco. The only issue I have with this apparent logic is that all specimens of the bottle have applied tops, and the date of 1887, while still possible, is a little late for this technique. The Spruance, Stanley & Co. variant must be some of the latest applied top bottles made. At least the question of which variant came first is easy to resolve simply by close inspection of the two bottles. And, their date of manufacture would have to be after February 1884. The first of the two bottles embossed DR. MOTT’S WILD CHERRY TONIC, with A.H. POWERS & CO. as proprietors. It was blown from about early 1884 to no later than 1887 when Powers liquidated his business and moved to Fresno County, focusing entirely on agriculture. The second version of the DR. MOTT’S WILD CHERRY TONIC bottle, embossed with the name of SPRUANCE, STANLEY & CO. as proprietors. 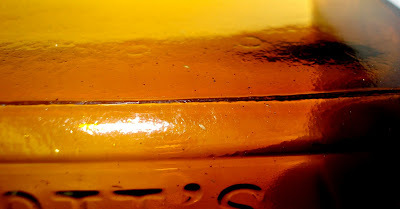 Close examination of the bottle shows the seam mark of the slug plate, indicating the mold had been modified. Other minor “fingerprints” show the mold to be identical for each variant. The first mention, that I have discovered, of Adolphus and Joseph Bondy is a listing in the 1851 New York City directory for Bondy Brothers & Co. Belts, working at 138 Delancy Street and residing at 140 Delancy Street. The 1852 San Francisco directory has a listing for A. (Adolph) Bondy doing business at 121 Sacramento Street San Francisco. As with other New York businesses, that were trying to capitalize on the gold rush market in California, the Bondy’s opened a store in San Francisco to sell goods that were manufactured at their New York business. 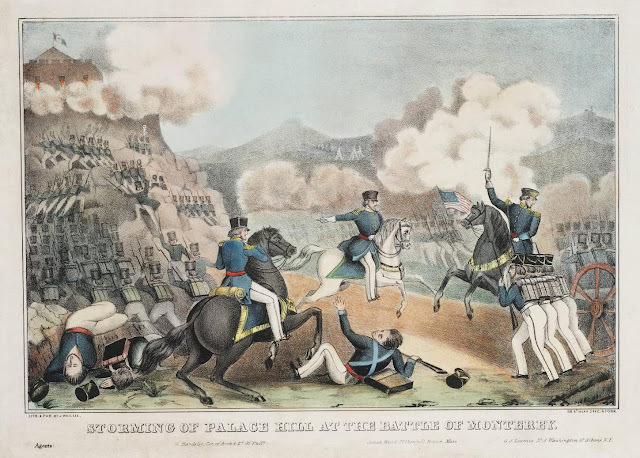 William Taussig & the Pollack brothers were other gold rush based businesses that manufactured in New York and sold in San Francisco to the gold rush market. Disk and belt loop for the cast Bondy clasp. As the gold rush market declines, in 1859, the Bondy Brothers move their business to 6 Dey Street in New York City and begin to manufacture shirts. The 1875 New York directory shows both Adolph and Joseph move to 25 Howard Street and are working in ribbons. The ribbons could possibly be for Civil War veteran organizations or some sort of trimmings on hats or clothes. In the US, from 1873 to 1879, 18,000 businesses went bankrupt, including 89 railroads. Ten states and hundreds of banks went bankrupt. 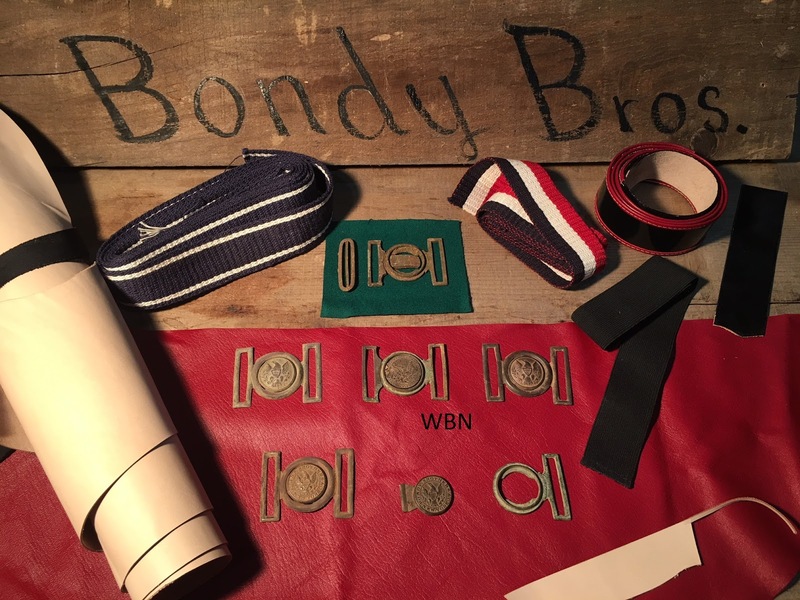 Unemployment peaked in 1878, Hard times for the citizens of the United States and the Bondy Brothers trying to make a living manufacturing and selling ribbons. New York City and residing in New Jersey. Will the Real DR. MOTT Please Stand Up! This western distributed Wild Cherry Tonic was named for Dr. Valentine Mott of New York City, a famous physician and surgeon that practiced medicine from the 1830's through the 1860's. Mott invented several "open secret" formula's and remedies that he left for anyone to use. 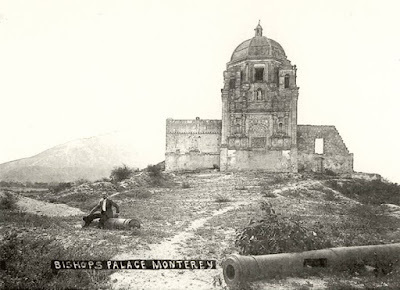 Sometime in the late 1870's A.H. Powers, a Sacramento California liquor merchant, introduced the Dr. Mott's Wild Cherry Tonic in an embossed sixth size square bottle . The bottle was embossed DR. MOTT'S WILD CHERRY TONIC A.H.POWERS & CO. Powers only marketed the Mott's tonic for possibly a couple of years and sold the rights to the product to the Spruance Stanley Company. Spruance Stanley continued to use the Powers bottle with the A.H. Powers slugged out of the glass and replaced with SPRUANCE STANLEY & CO. 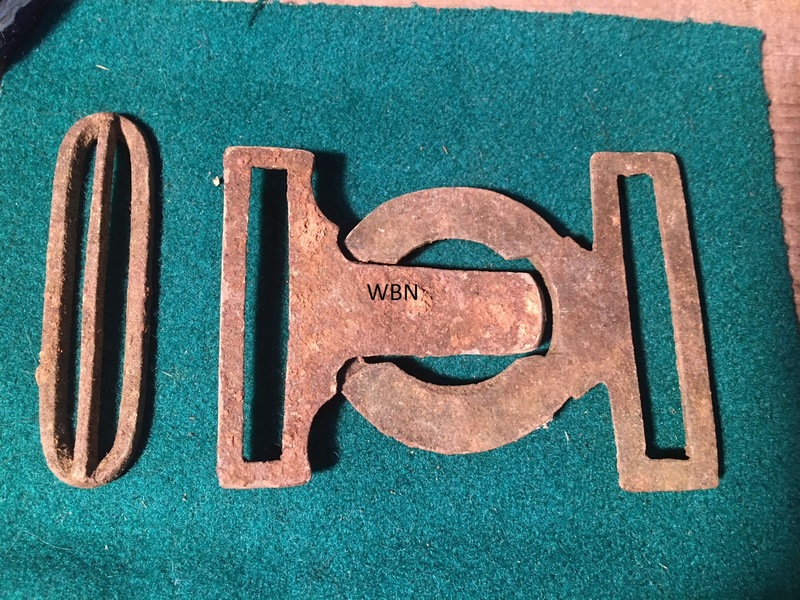 Both the Power's and Spruance Stanley examples come with an applied top and the characteristic 2 rivet marks (or dots) on the lower portion of the panel to the right of the embossing. (pictured at left) The Louis Taussig product bottle and the Acorn Bitters also come with the rivet marks in the same place on the same panel suggesting they were possibly blown in the same mold. The Powers and Spruance Stanley examples of the Wild Cherry Tonic are considered rare but the Spruance Stanley bottle seemed to be the more difficult of the two examples to put in my collection. If you are looking for a nice pairing of western square sixth's the Powers and Spruance are a fine addition to a western collection. 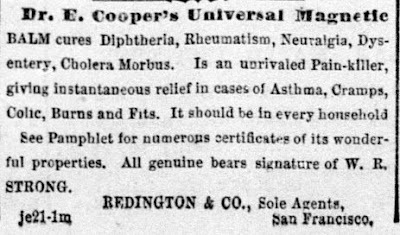 Dr. E Cooper ‘s Universal Magnetic Balm was first advertised, here in the west, sometime in the mid 1860’s. 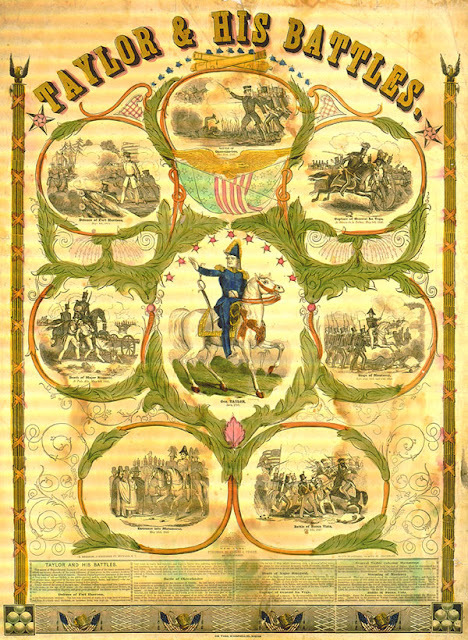 Advertisements from the Sacramento Daily Union during the 1867 time frame list W.R. Strong as the Proprietor of the product doing business at Nos. 5 and 9 J Street in Sacramento California. 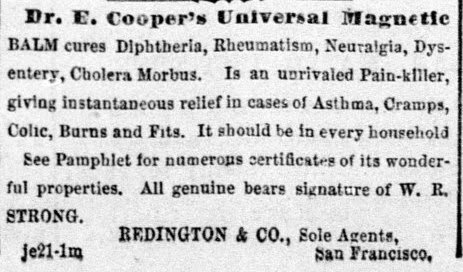 Later advertisements from 1868-69’ period list Redington & Co. from San Francisco as sole agents for the product. The two examples of the E.C. Balm in my collection are embossed only on the front panel “Dr. E.C. BALM” do not have curved “R’s” or embossing on the side panels. Each example is from a different mold and the tops on the bottles are completely different. Both of these bottles are fairly crude, have that deep aqua colored glass and quite possibly were blown here in a western glass house. 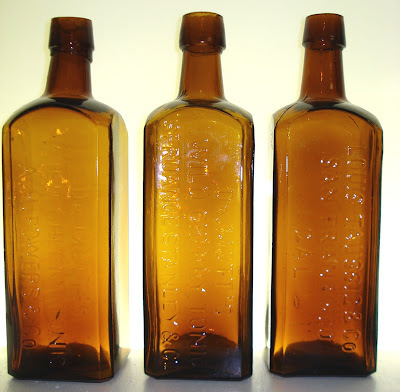 Tim Higgins, in his book, “Early Medicine and Apothecary Bottles of the Old West” lists an E.C. Balm with W.R. Strong embossed on one side panel and Sacramento embossed on the other side panel and considers this bottle extremely rare. Tim also relates this bottle comes with the signature western curved “R”. The western blown example, pictured to the left, is marked Dr. E.C. Balm on the face of the bottle, Sacramento on one side panel and W.R. Strong on the opposite panel. The tooled top is crudely formed and has similar characteristics to one of the examples in the upper left picture. As with most of the medicines that were marketed early, the Dr. E.C. Balm claims to cure everything from Dysentery, burns and bruises to fever and Ague. And, of course, it was recommended for the entire family. The E.C. Balm, in my opinion, is an interesting, fairly scarce western distributed medicine bottle that is still an affordable piece of western history. The first time I saw this California Gold Rush rococo revival masterpiece I was completely overtaken by its beauty. This clasp draws more attention than most and is recognized by collectors as the top California Gold Rush clasp. 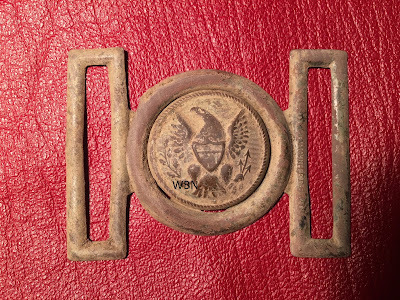 The foliate edges & 31 stars surrounding the EUREKA seal are unique to this clasps design. Many of these have casting variations on the front as well as on the back & none are exactly the same. Some of these are W.T. 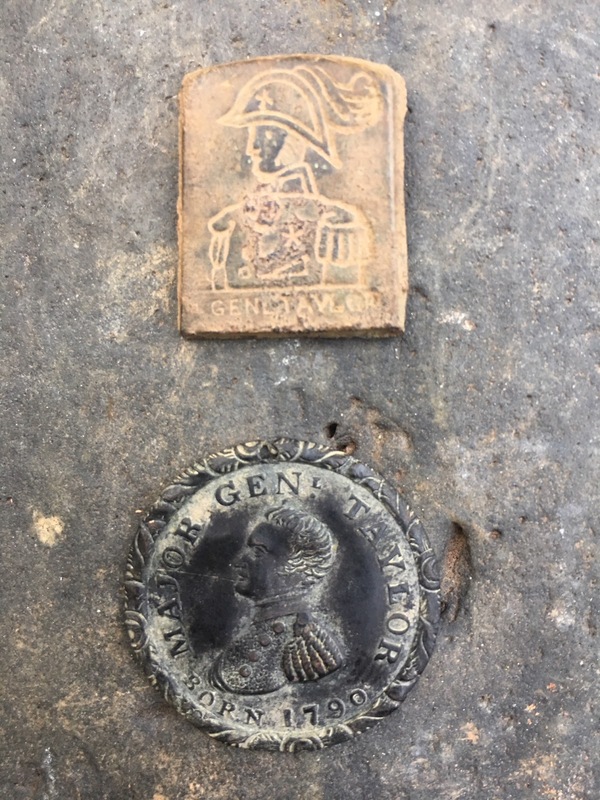 & Co. back marked while others are not. The W.T. & Co. tongues have a T. cast in the back. This may have represented the correct location of the top when this was created. 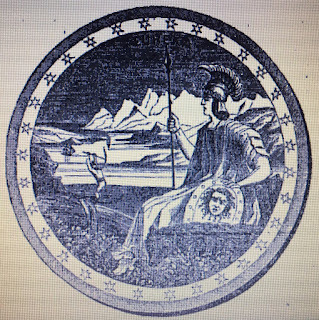 Typically speaking a back mark such as this would be from the manufacturer. It would be odd to have a belt manufacturer request to have his abbreviated company name cast on the back. Other clasps that are recovered in the same context as the EUREKA are marked very clearly for the consumer. 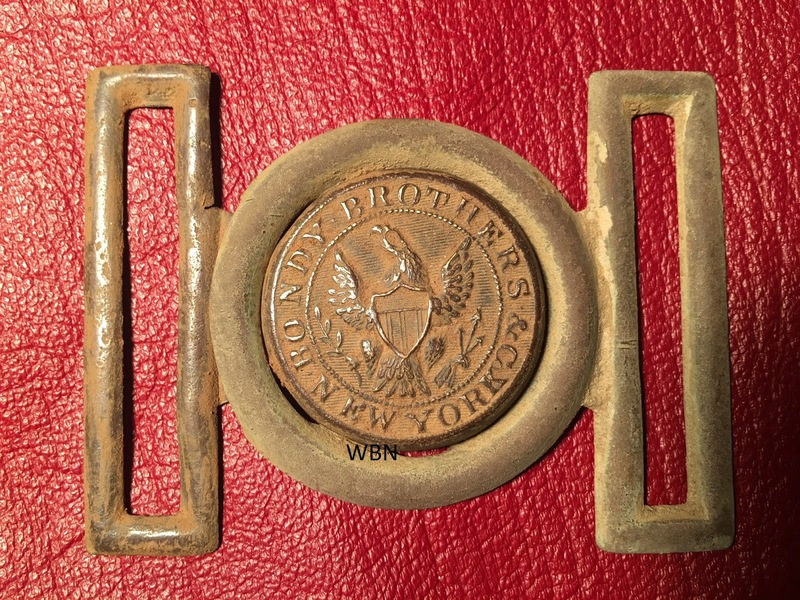 Bondy Brothers belt manufacturers, W. Taussig , Pollack Brothers , (Pollock) have listings in directories and newspapers describing their occupation. 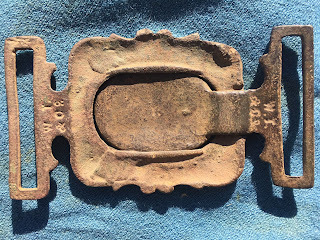 None of the known 1850s clasps recovered in California are from companies who stamped or cast their own brass clasps to date. To my knowledge the W.T. & Co. back mark was first mentioned to be the abbreviation for William Taussig & Co. in the 1996 book titled American Military Belt Plates. I have been skeptical of it being the mark of William Taussig & Co. for quite some time. In the last few months I worked for many hours to come up with something solid in my research & at one point thought the mark may be attributed to the pioneer brass foundry of William Thompson Garratt & Co. of San Francisco. I waded through everything I could find and I had a change of thought. If I can’t pin down W.T. & Co. maybe I could unlock the mystery of the other known W.T. 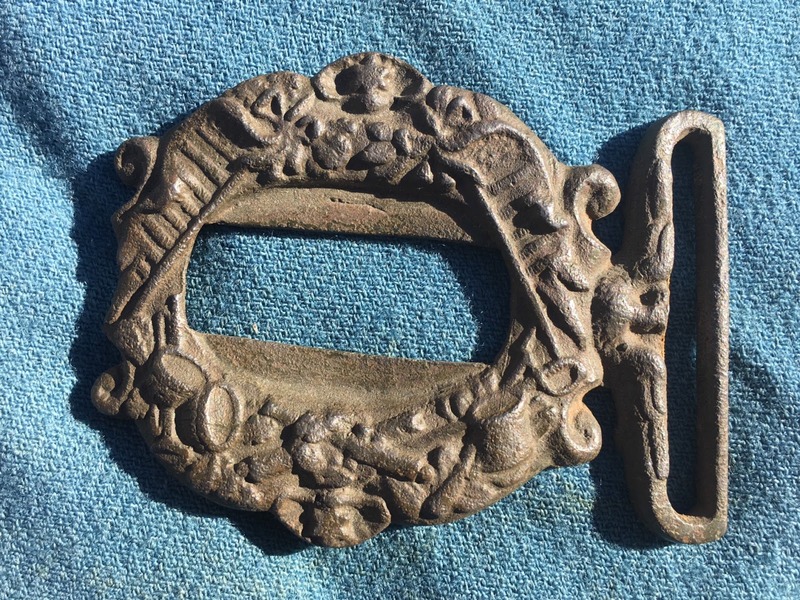 & Co. clasp. Notice the six pointed stars as seen on the EUREKA clasp and many others. 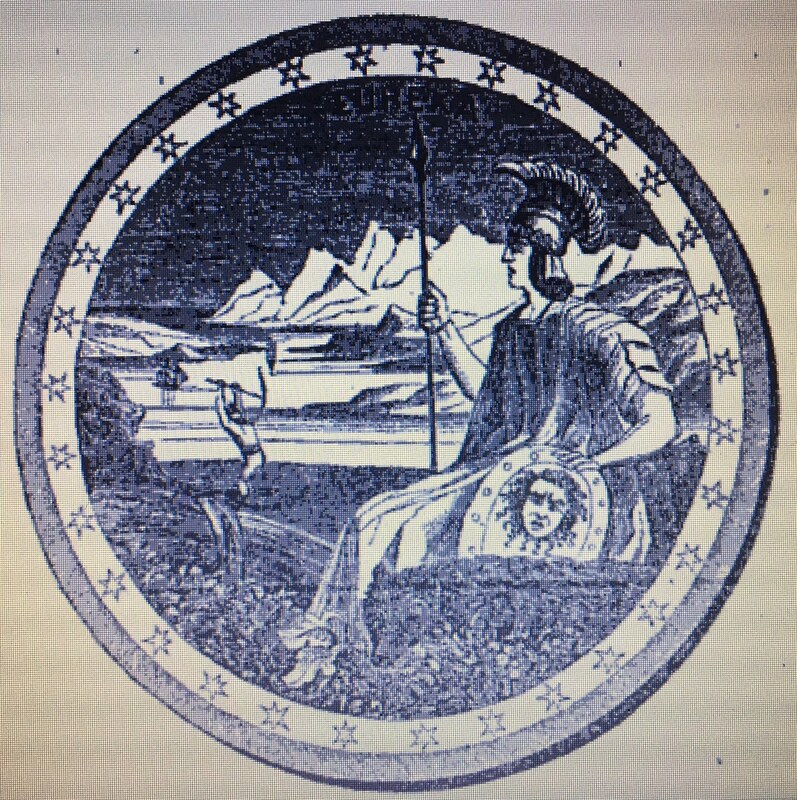 California's Admission Day event on September 9, of 1850 was a very important event and since the seal created by Major Garnett had already been adopted on September 29, 1849 at the Constitutional Convention in Monterey California. 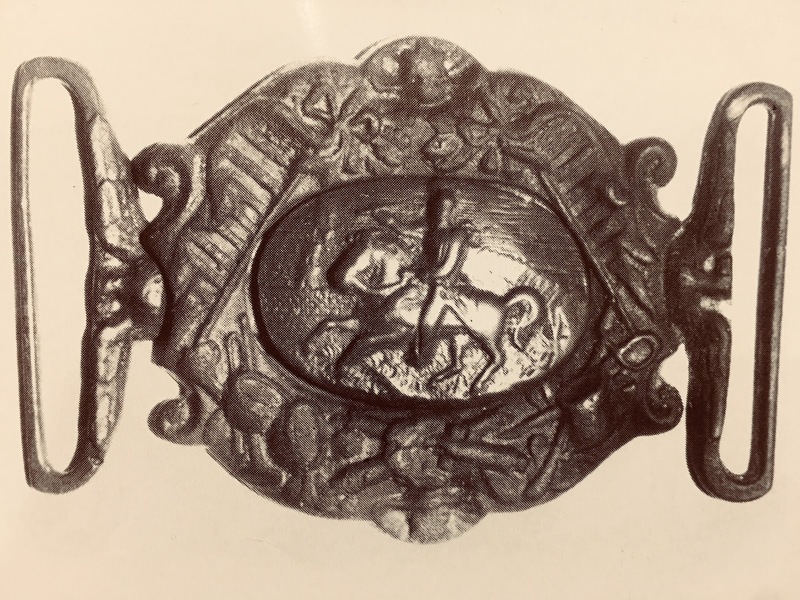 This time frame would fit in perfectly with what is to come knowing these two clasps were produced during the early part of the California Gold Rush. 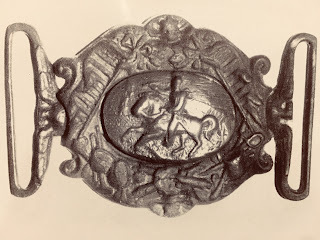 The EUREKA seal depicted on a clasp would have been known to most in California by late 1850 and I felt this other clasp may have been created for another well known event in United States history. The wreath portion of this clasp is truly amazing. Many of the elements on this clasps wreath are depicted in the poster above of Rough & Ready and battles of the Mexican American War. 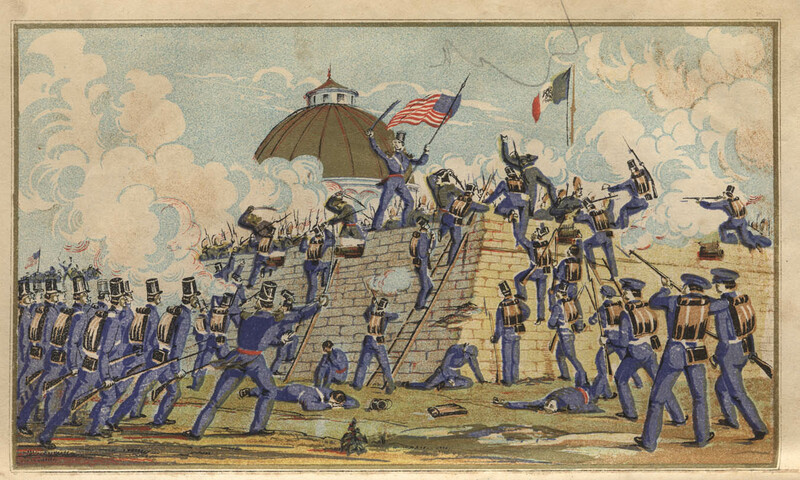 A star at the top and bottom , Unfurled United States flags on the left and right flank , drums, Trumpet or bugle, crossed cannons , saber for cavalry and musket for infantry would be recognizable to anyone and would suggest a special victory or event for a V.I.P. such as Major General Zachary Taylor running for presidency . 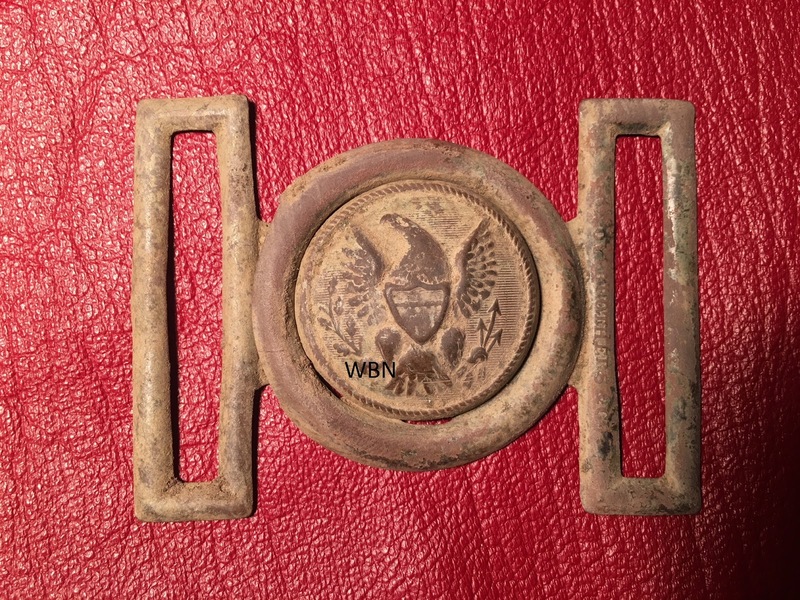 Notice the likeness of Major General Zachary Taylor and his celebrity war horse “Old Whitey” & the patriotic United States motifs which appear on the brass clasp. 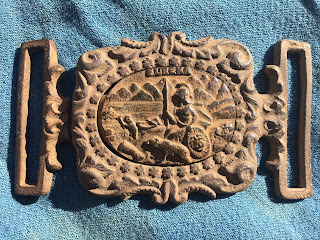 California Gold Rush Rough & Ready artifacts I have dug on private property with owner’s permission.